I don't usually post about make-up because if I'm totally honest I don't buy that much and when I do, its usually repurchases- that and I don't know what to say. "Its...shiny?" "I really really like it!" 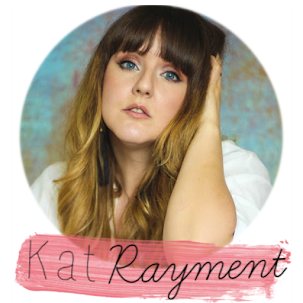 Wow Kat- thanks for that! But on this occasion I actually have rather a lot to say on this burgundy palette from Maybelline. Firstly sorry not sorry that I have used the shadows before photographing. 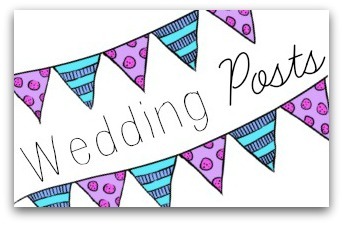 I hadn't intended to write about it but even so, it's proof I use it right!? 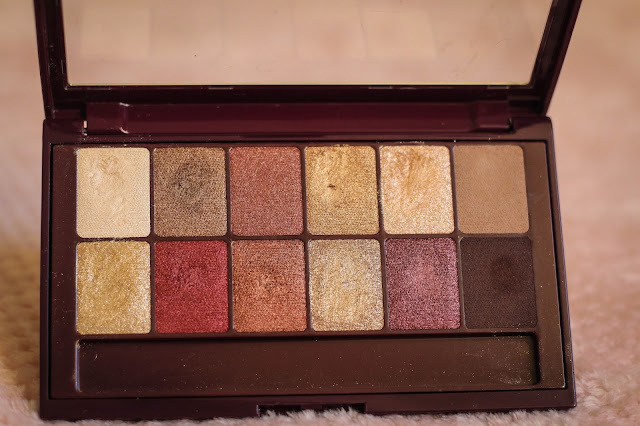 I got this palette from as part of a Secret Santa gift this year (thank you Lucy, I know it was you!) and couldn't wait to try it out. 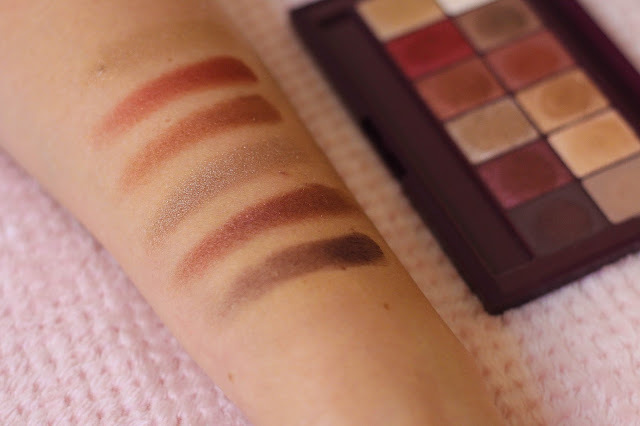 I've been lusting for some burgundy shades on my eyelids and this palette encompasses lots of different shades with some gorgeous coppers and golds to compliment the red hues. The shadow consistency is really buttery and soft- something I never understood when people said that until now. 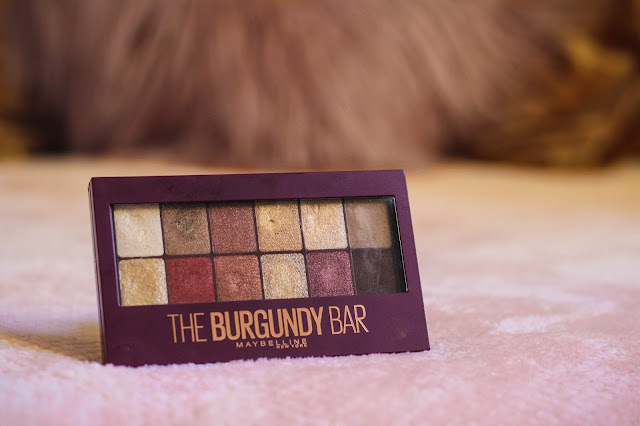 The burgundy shades are highly pigmented too which is impressive for a high street palette and I even like the little brush that comes with it even though a makeup artist would shudder at the thought of it. 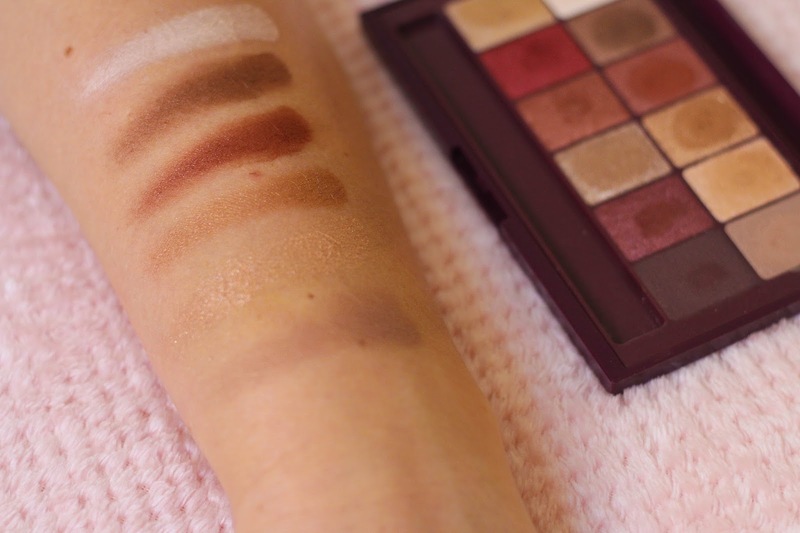 Some of the golden tones are more subtle but they are great for a natural look, making this palette great to take away for a weekend away; encompassing all the shades you need for every occasion. The colours I've been drawn to and used the most of so far are the lightest shade (top left, first one) to highlight the inner corner of my eye and define my brow bone, the reddest shade (bottom row, second in from the left) for an all over smokey eye that really compliments blue eyes and the dark gold shade (bottom row, fourth from the left) as it's an unusual topey gold that just looks so goddam pretty! There is some fall out when applying them but in my opinion its nowhere near as much as the likes of Urban Decay shadows and you can forgive it that sin seeing as the colours are so pretty. I tend to apply my foundation after if I'm going for a smoky eye to avoid the smudge of shades into my base. 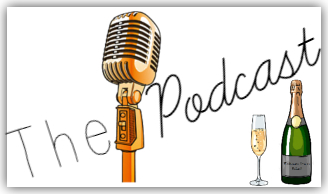 Now if you're not a fan of shimmer (who are you!? ), this palette probably won't be for you as only two shadows are matte but if you love sparkle and shimmer you will luuurve this palette. It's perfect for autumn winter with the reddy tones but also I think the gold and bronze tones will be perfect for summer time. In the past I've had eye shadow palettes with some shades that you just never dip into but I can see me using every single one in here as they're all wearable and lovely. 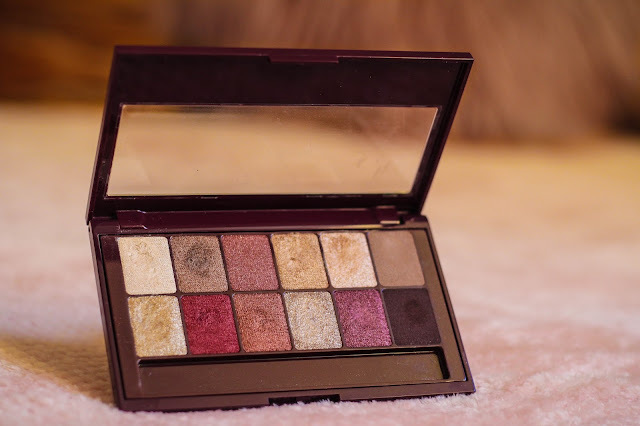 It's nice to veer away from pink eye shadows for a change and since owning this palette its really stepped up my makeup game and made me feel like a new woman! It's amazing what new makeup can do for your confidence and mood. At £11.99 in Boots, it's a great price point for everyone and definitely feels a lot more luxurious than you'd think it would be. 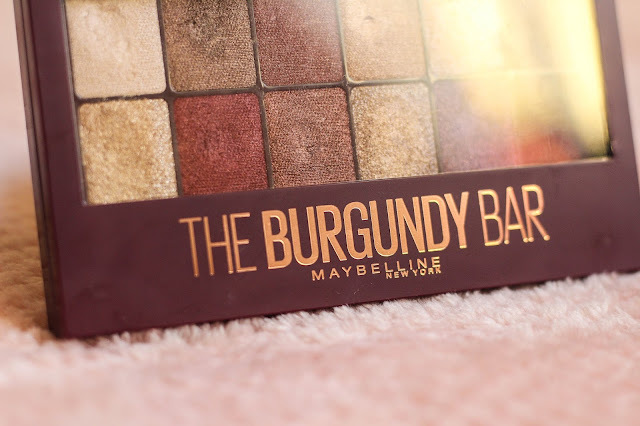 Are you a fan of The Burgundy Bar? I'd love to know what palettes you are loving at the moment!